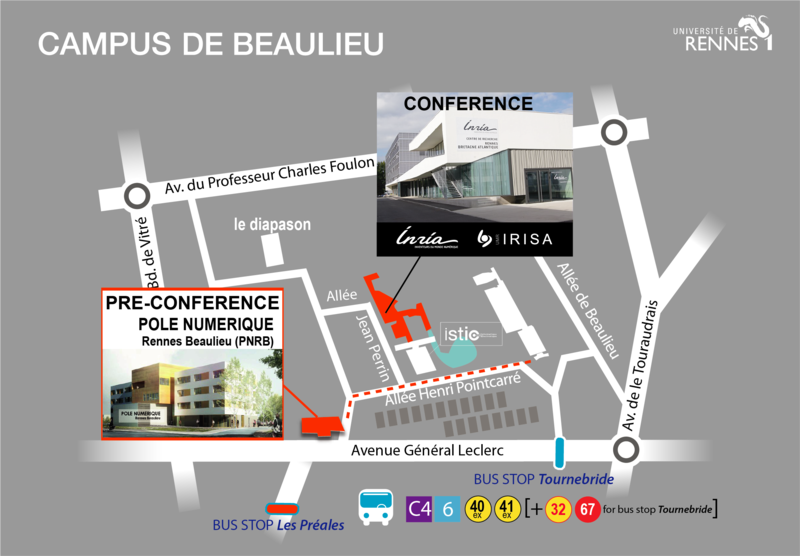 The easiest way to get to the Campus is by bus: lines C4, C6 and 40 all start in Place de la République, and also stop at Musée des beaux arts, which should be within easy walking distance from all suggested hotels. The closest bus stop to the conference location is Les Préales. Buses should be fairly frequent, and travel time is roughly 15 minutes. Tickets can be purchased by the unit in the buses themselves (unit price: 1.50€ – Validity: 1h). Alternatively you may buy 10 tickets in one go in the vending machines in the underground station at République (14.50€ for 10 tickets). We recommend buying all your necessary tickets in advance to avoid creating long queues at the bus entrance.